Christian D’Agostino, Executive Chef and managing partner of Twist, the Boiler Room and Sanctuary Events Center catering, has a culinary background that truly spans the world. Christian describes his style of cooking as a culinary documentary of his career. Having worked in every type of kitchen imaginable, his experience is unmatched by many of his peers. His career began as dishwasher at an Italian restaurant at age 13, gained momentum with acceptance to The Culinary Institute of America, Hyde Park, NY and jump- started with a position as Executive Chef of an exclusive City Club in Birmingham, Alabama. Shortly thereafter, Christian was presented with the opportunity to serve as Executive Chef on cruise ships. With itineraries spanning the globe, Christian had access to the coasts of Alaska, the islands of Greece, the beaches of Spain, and the crystal blue waters of South America. With each stop came the unique foods of the area and an opportunity to learn, making Christian a truly world class Chef. 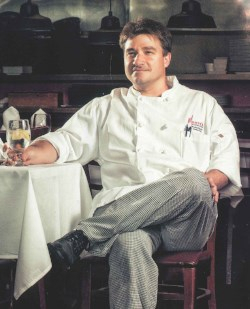 After returning stateside, Christian relocated with his family to Moorhead, MN, where he would serve as Executive Chef of Sorello’s restaurant until 2009. Christian then joined the opening management team at the Hilton Garden Inn in Fargo where he served as Executive Chef/Food and Beverage Director until 2012. He has since moved on to own multiple restaurants within the Fargo Moorhead area.